Now at the pinnacle of your career, you are sought after by two capital cities to build their city centres. Not only do you have to consider the natural features that were the reason for their founding, you also need to ensure the civic buildings are appropriately placed, and you must not forget to satisfy the citizens demands along the way. 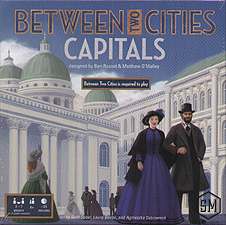 Between Two Cities: Capitals expands the base game by adding several new challenges: landscapes, districts, and civic building tiles. This not a stand-alone expansion, you'll need the original Between Two Cities game to play it. Also contains 1-2 player game variants.